WHAT WILL MY ADVERTISING BE LIKE? So glad you asked! Auction advertising is HIGHLY focused on the PROPERTY (not an agent). It is also designed to be glaring and grab attention. Let's look at the specific advertising media utilized to promote your auction. 2. Television Ads on CNBC. As ASF noticed a marked decline in the readership of newspapers, we reacted by diversifying our advertising media for promoting our auctions. Accordingly, we now often run 30-second television commercials promoting upcomig auctions. 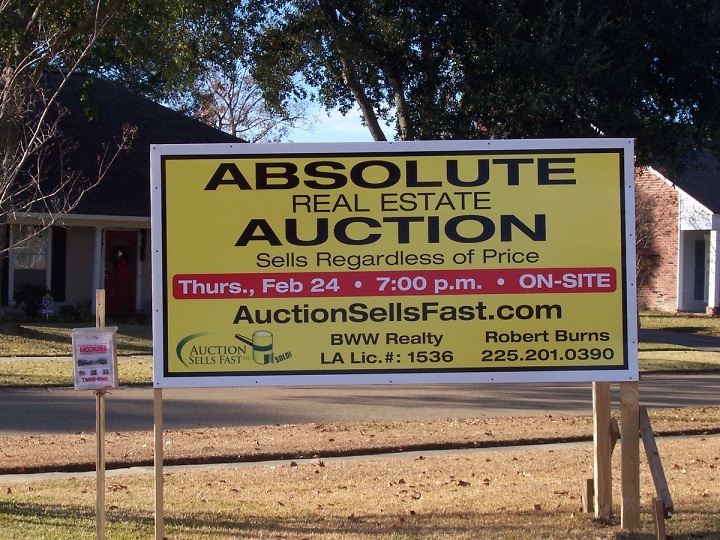 To see an example, merely view the YouTube video below, which represents a commercial we ran to promote an absolute auction in Wedgewood Subdivision in Baton Rouge which transpired on February 24, 2011. Auction signs often attract more bidders than any other media. Why? Because they stand out!! A "traditional" real estate sign is boring (i.e. "For sale, agent name, firm name, phone #."). Compare that with a "Let's get it on" auction sign, one of which can be viewed by Clicking Here. 4. Extensive Internet Advertising on ASF's Website. The internet is the SINGLE best informative tool which has revolutionized not only the auction business (consider E-bay) but most other industries as well. For us, it allows quick dissemination of explicit detail, including extensive property photos and detailed directions. To see a typical internet advertising page, Click Here. 6. Email Broadcasting to ASF Email Property Alert List. The best and fastest way we disseminate auction information is via email. Thereby, folk on our alert list often get information five or six days before the first ad runs in the newspaper. You'll receive email property alerts before they even appear in print media! 7. Internet Advertising via Craigslist. Craigslist continues to erode the audience of print media's classified sections (particularly among younger audiences). Accordingly, all ASF auctions are placed on Craigslist. 8. Promotional Flyers Mailed and Provided Online. In summary, auction marketing is intense and high-profile. Even with all of this promotion, there's one other major advertising medium: word-of-mouth. People talk about auctions, both before and after. It's a high-profile affair and that's by design! Come out and join us at our next event! We'd love to see you there. What's the cost of this advertising? At rates in effect as of July 2013, typically between $1,700 and $2,900, depending upon the type of property and resources deemed required to promote the property properly. � 2002 - 2013 AuctionSellsFast.com. All rights reserved.